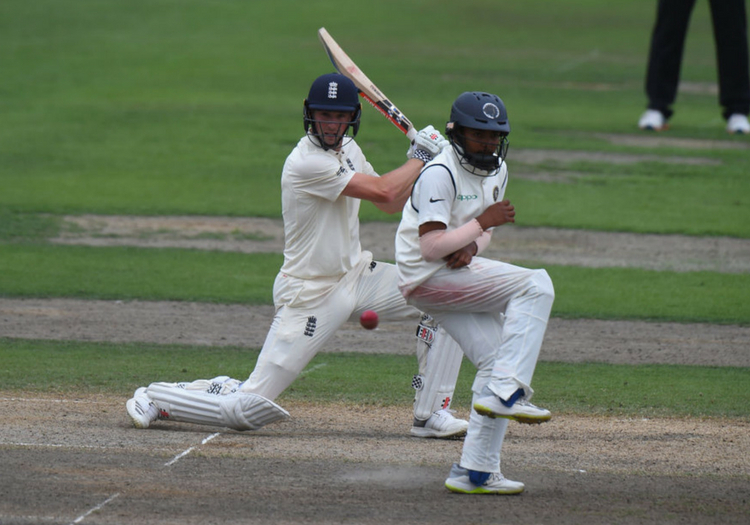 Curran earned figures of 5-43 as the Indians slumped from 189 for four to 197 all out in their first innings, with Woakes collecting two wickets to confirm his comeback after knee and quad injuries is on track. Then Malan and Pope made half centuries – a second of the match for Malan, and Pope on his Lions debut - as the Lions made 194 for five in their second innings before declaring late in the day. The Surrey allrounder had Rahane caught behind down the leg-side with his first ball of the day, then pinned Shahbaz Nadeem lbw with his second. Woakes drove a catch to deep cover in the over after Pope had reached a 71-ball half-century, and Burns declared to set the Indians a tricky mini-session in the fading light – during which Porter bowled Murali Vijay in the first over, then Curran had Prithvi Shaw edging to Malan at second slip in the second, before Porter won an lbw decision against Mayank Agarwal in the last over of the day.